With some being excellent garden plants Correa are a widespread genus with species found over South Eastern Australia and across Southern Australia to Western Australia. With about 20 different species the best known may well be the hybrid species that appear in nurseries today. Being frost hardy, these wonderful plants are sold all over the world including the UK and USA. Most species are low growing shrubs, however the interesting Correa lawrenceana is very variable in height and can grow to form a small tree. These hybrids are a more compact form. 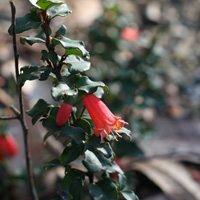 Correa are sometimes referred to as ‘Native Fuchsia’ a name it shares with epacris longiflora. Although generally drought tolerant, hybrid species do best in a moist humus rich well drained soil. Partial shade is best, but plant in a position where the flowers can be seen during May through to september. Correa are great for attracting birds. Correa reflexa and pulchella are two of the more popular species. Correa ‘Dusky Bells’ is well known. Some of the low growing Correa species such as Correa decumbens make excellent ground cover plants. Correa reflexa prostrate also works well as taller growing ground cover plant. An Australian Native, generally low growing small to medium shrub to around 1m and are easily grown in the home garden they can make an excellent landscaping plant. A sunny position and a well drained soil are essential for good growth. Water well when planting, but once they are established most species are reasonably drought tolerant.